Between winter and summer we have transitional times, represented by the spring, and we must prepare with the right clothes. So the best solution, if you ask me are the light knits. Long, medium or short, no matter, they are perfect solutions for this Period of time. And here I mean cardigans, simple sweaters, dresses, cropped tops, crew necks and sporty sweater dress. Here is a perfect example of light knitwear. Yes, indeed it is an elegant smart casual color blocking knit sweater dress perfect for a lot of situations. You will look very chic and if you are creative enough you may try it in combinations with skinny jeans and boots. If you love wearing denim jeans I would go for a Denim Tlapel Streak Cardigan . Soft and comfortable this long cardigan will give you a lovely slightly vintage and chic image. This type of loose style cardigan sweater seems perfect for every fashionista. Love to feel comfortable and to have a versatile outfit? Well then this long sleeve knitwear is the perfect solution for you. Some times you just need to feel comfy? Isn’it? 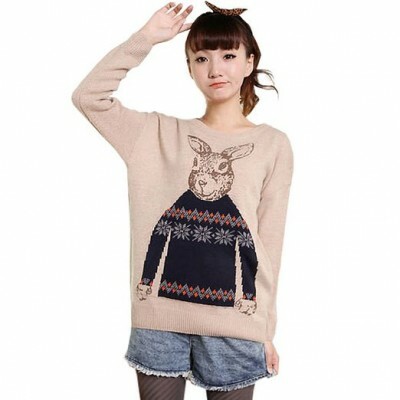 I just love the printed knitwear, looks so cute and comfortable. A hooded loose sweater is in my opinion a perfect knitwear. Yes, it is like a hoodie, except the fact that it is even more versatile. I absolutely love it.